Most would see these and think that they belong in a salad bowl. But, this blog is not about salads (phew!). Although it may contain a few here and there for health reasons. 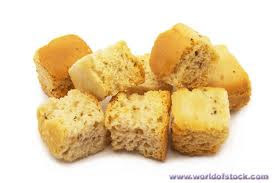 Some would see croutons and picture them atop a bowl of steamy soup. Again, not about soups. And then there are those of us that see croutons and think comfort-snack-food. That would be this girl. I can kick back a box/bag in one sitting. In fact I have...3 times this week. I prefer them homemade- crispy and salty on the outside with a chewy soft inside. Any stale bread will do the trick really. But, if it comes down to it, Pepperidge Farms Classic Seasoned are my go to brand of choice (I may or may not have screamed in the condiment aisle to the embarrassment of my husband when my grocery store started carrying them again). I cannot remember a time that croutons were not a part of my life. In fact, I loved them so much as a child that for Christmas the year I was 8, Santa brought me a 5 pound bag of croutons. I wish I still had the photographic evidence to prove this undying devotion I have for croutons- one of me in a green Christmas dress with Christmas light tights standing in front of the Christmas tree proudly displaying this gift. But, my older brother decided it would be better served on display for a high school Spanish project some years ago and has not been seen again since. Another fateful day in my love affair with croutons, was the day that I was visiting a friend in New Hampshire and we happened by a Pepperidge Farms outlet store. Some brakes were slammed and there may have been an illegal u-turn in order to purchase as many boxes of croutons as would fit in my suitcase...5 if my memory serves me correctly...and some socks may have had to be sacrificed in the process. Again, photographic evidence lacking, there is a picture somewhere of me holding all five boxes smiling proudly in front of the outlet store as if I were in the happiest place on earth. 2. Cut the bread into generous sized cubes. 3. Combine the melted butter and olive oil in a small bowl or glass measuring cup. Stir in seasonings. 3. Put bread in a resealable bag and pour butter mixture over top. Seal and shake. 4. Spread bread in a single layer on a baking sheet lined with non-stick foil. 5. Bake for 15 minutes until golden brown, turning halfway through.